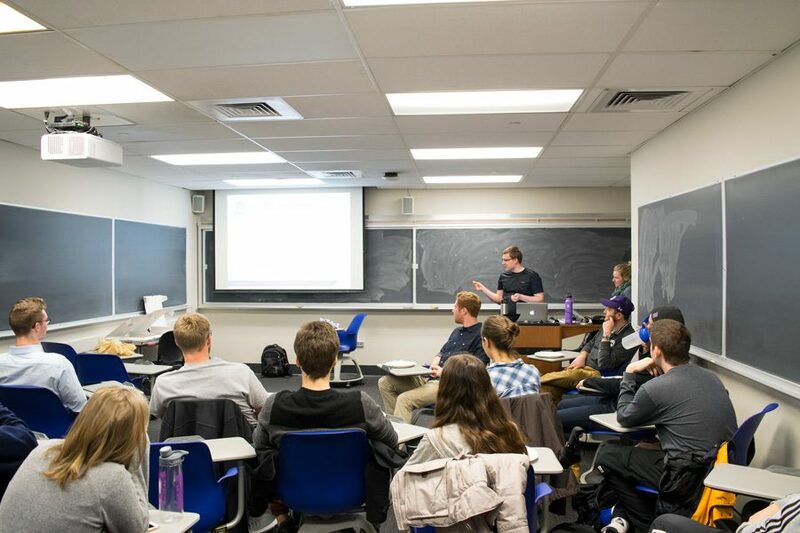 House by Northwestern team members speak during a information session in the Technological Institute on Tuesday. The project is set to break ground in May. House by Northwestern will start construction at a lot near the intersection of Colfax Street and Orrington Avenue, said Maggie Waldron, HBN director of program operations, partnerships and communications. The house is expected to be completed by the end of July, Waldron said. In October, the team will present its completed house in Denver, Colorado at the 2017 U.S. Department of Energy Solar Decathlon, a competition that challenges collegiate teams worldwide to design and build functioning solar-powered houses. This is the University’s first time participating in the competition, Waldron said. With a project budget of $1.4 million, the completed house is expected to feature enough energy-saving technology to be net-energy positive and 90 percent more energy efficient than the average home, Waldron said. Like many of the other houses in the competition, the HBN project will have solar panels that are connected to a residential battery, which stores the solar energy and results in a structure that will supply all its own power, Waldron said. The house, however, will still be connected to the electrical grid, she said. An advanced heating and cooling system, which is four times more efficient than average systems, is also going to be used to save energy, she said. In addition to the sustainable technology, the interior and exterior of the house will be coated in Pureti, which is a clear photocatalytic compound that breaks down airborne pollutants when it comes into contact with sunlight, Waldron said. The project not only supports the University’s commitment to sustainability, but it also provides a hands-on learning opportunity for all the students involved, Waldron said. McCormick junior Andrew Crane, the project’s construction manager, said he has been able to apply what he has learned in his classes to his role on the project. Waldron said the team is still recruiting new members as the decathlon nears. Opportunities include being a tour guide for the house in Denver during the competition and designing multimedia communications for the competition exhibit, she said. This story was updated to clarify that the house will supply its own power but will be connected to the electrical grid.